Should development be extinguished on California’s fire-prone hills? 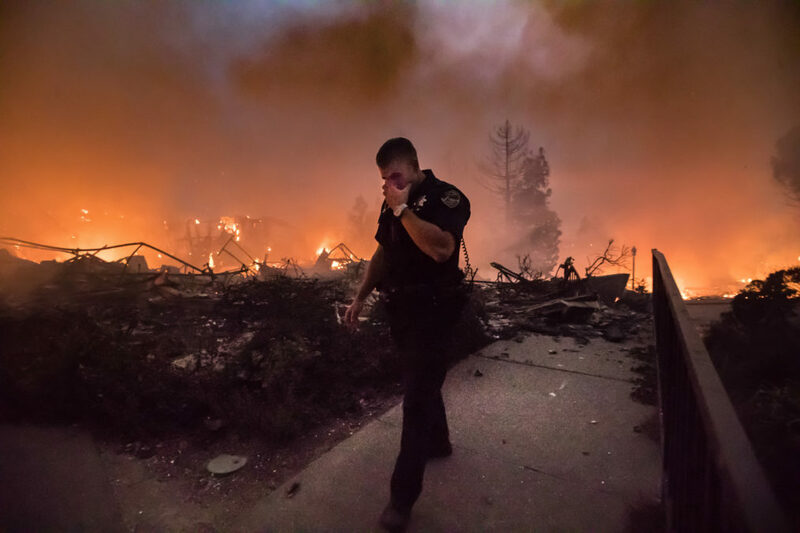 San Rafael police Officer Mark Wilkinson closes his eyes against smoke from the Tubbs Fire in Santa Rosa, Calif.
Lars and Ulla Tandrup finished plans for their dream house on the wild western edge of Northern California’s wine country late in the summer of 2015. The 4,200-square-foot boxy, modern home would perch on a ridge over Santa Rosa. With two stories of floor-to-ceiling glass on its western face, it would sit open like a dollhouse facing a field of golden grass. Sonoma County officials took a few months to review the project. Between the drainage review and fire inspection, a warning sounded just over the mountains, a few dozen miles away. It started small: A backyard hot tub’s faulty electrical wiring overheated and sparked a dry patch of ground. By the time the resulting blaze officially was contained a month later, it had killed four people, burned more than 76,000 acres and destroyed nearly 2,000 buildings in Lake County. What became known as the Valley Fire was the third most destructive in California to date. 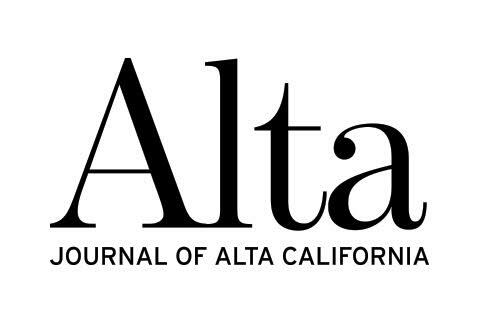 A version of this story also appeared in the Journal of Alta California. The reckoning followed a pattern that Californians know well. 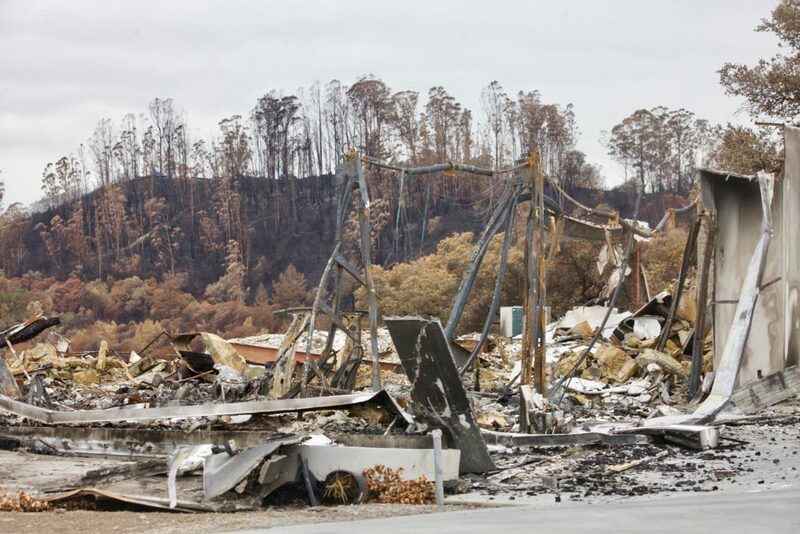 Scientists tsk-tsked that such fires would worsen with climate change; officials promised better building codes to armor new homes against fire; and the community, backed by benefit concerts and limited-edition wine sales, vowed to rebuild. Construction of the Tandrup home continued. By last summer, it was complete. Long, sleek lines led from the kitchen through the dining room, out to a wooden deck and an infinity pool. Built to the latest fireproofing standards, the home had vegetation clearance and screens over gutters and vents to block flying embers. Its roof, sheathed in a fireproof synthetic, gleamed as white as a bleached skeleton. While it felt secluded, it was just 15 minutes from the mall in central Santa Rosa. Unruly oaks and neatly planted palms concealed the decades-long sprawl from the city into the wilderness. It was a period of growth that began after 1964, when these hills were scorched by one wildfire, the Hanly, and ended when they were consumed in October by another, the Tubbs, which marched right into the Hanly Fire’s footprint. 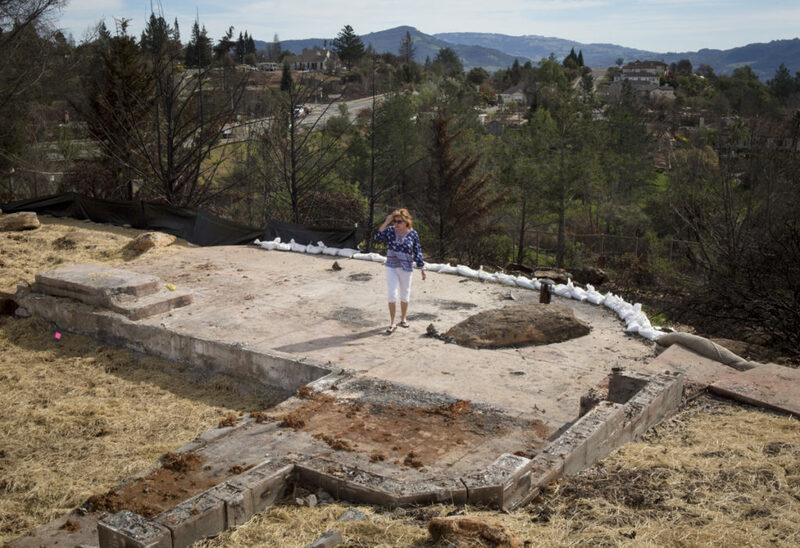 Among the houses destroyed by the Tubbs Fire: the Tandrups’ dream home. Sonoma County’s hillsides are particularly picturesque and expensive. But their history of fire and development is instructive because it is so typical. And now, some officials and residents have begun to wonder aloud whether some fire-prone areas are too dangerous to inhabit. The population in Sonoma County’s wildland-urban interface, the high-risk boundary zone between nature and the built environment, increased about 20 percent between 1990 and 2010, according to county records – a rate that an analysis by Reveal from The Center for Investigative Reporting found matches the national median. As of 2012, there were 46 million homes in these areas nationwide. In the half-century-plus between the Hanly and Tubbs fires, people arrived in Sonoma County knowing nothing of the wildfire past. Planners and builders, who did know the risk, trusted it could be managed with fireproof building materials and clearings around homes. But for some, the Tubbs Fire has shaken that faith. Reveal took a deep look at the county to understand how development progressed in a place with a history of wildfire and to explore decision-making about development after fire returns. Five decades’ worth of local planning documents and records from home-by-home inspections conducted by the California Department of Forestry and Fire Protection after the October fires offer some explanation. Conventional wildfire planning suggests that newer homes, built to tougher fireproofing standards, would fare better than older ones. But an analysis of Cal Fire data from the Tubbs Fire defies that logic: A building code update added new fireproofing standards for homes in the wildland-urban interface in 2008. Yet, according to the Cal Fire inventory, 56 of the 64 homes built after that year in the Tubbs Fire footprint were destroyed. The destruction was nearly complete. Reveal’s analysis showed 96 percent of homes touched by the fire were ruined and three-quarters of properties inside the fire footprint lost a home. It was from these wild hills northeast of Santa Rosa that Thomas Lake Harris announced, in 1891, that he had conquered nature and discovered the secret to eternal life. Harris, with deep-set eyes and a wild white beard, was among America’s most famous spiritualists, and the utopian commune he called Fountaingrove was his Eden. In the cool climate, his followers grew grapes and crafted a popular wine, while a warm breeze hugging the hillsides nurtured oranges, avocados and persimmons. Despite his promised immortality, Harris died in 1906. Subsequent owners converted the vineyard to a cattle ranch, but the land maintained a privileged place in local culture. For decades, Santa Rosans would ascend the hill for dinner parties at the grand estate; in the 1960s, these were elaborate costume affairs where, The Press Democrat reported, civic leaders dined and danced, dressed as gypsies, Mexicans or Dust Bowl refugees. One September afternoon in 1964, the hot, dry Diablo winds fanned a brush fire that blanketed the ranch and stopped just shy of the town below. A stunned local fire chief told the San Francisco Chronicle that it was like fighting a flaming yo-yo: “The wind just hangs back, then fire comes in a rush with the wind, and you’re dead.” Before firefighters could contain it, 53,000 acres had burned in what became known as the Hanly Fire, named for the ranch on Mount St. Helena where it started. But three days later, the front page of The Press Democrat heralded the “Miracle of Santa Rosa:” Despite the destruction, not one person had been killed. Santa Rosans hurried to cover signs of the fire. The state sent planes overhead to seed the scorched hillsides with grass. The parties at Fountaingrove continued. In 1971, the owner of the ranch, a cattleman named Robert Walter, proposed a 2,000-acre development on his land that would jump-start a building boom in the hills. The plan included an office park for the technology firm Hewlett-Packard, plus hundreds of homes for its employees. 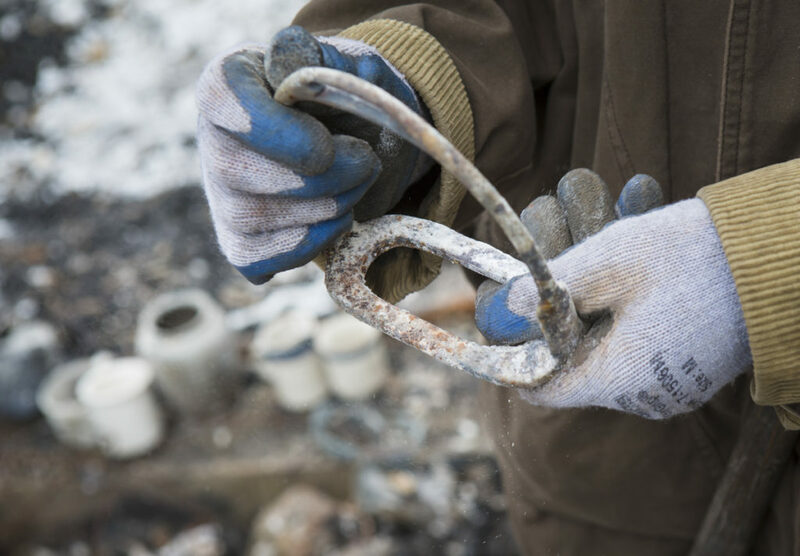 John Fouts, whose family guest ranch has suffered three wildfires, including the Hanly and Tubbs, remembers being shocked by plans to put so many homes on hills that had burned so recently. At 17, he’d scrambled to save his family’s buildings from the 1964 fire. He’d seen how thinly the firefighters had been stretched and shuddered at the thought of hundreds of families trying to escape such a fast-moving fire. The 1964 Hanly Fire occurred just as California leaders began to see the risk of building communities in the woods. The state began requiring cities and counties to draft strategic plans to ensure their growth considered natural hazards. Nearly a generation later, after the 1991 Oakland Hills Firestorm killed 25 people and reduced 3,450 homes to ashes that swirled across the San Francisco Bay, lawmakers demanded wildfire risk maps for the entire state. Sonoma County’s maps presented planners with an evolving picture – changing definitions and particular neighborhoods drifting in and out of the most hazardous zones – but certain hilly pockets east of Santa Rosa always were shaded in the darkest red, indicating the highest fire risk. While knowledge of fire risk has improved, people continue living in woodland communities that were marked for development decades ago, when far less was known. Across the country, tens of millions of people moved into the fringes of America’s wilderness in the last half of the 20th century. By 2010, the population in the wildland-urban interface was about 100 million – and growing. The Tandrup home was in a subdivision carved into a wooded ridgetop in the early ’90s. Cal Fire’s maps placed the home within a curtain of moderate fire risk that spanned the eastern edge of Sonoma County. Santa Rosa’s first general plan, drafted shortly after the Hanly Fire, urges caution in development regarding earthquakes and floods, but not wildfires. The current plan does have a section about wildfire risk but doesn’t suggest limiting development. At the county level, a 1986 draft plan called for no more than one home per 20 acres in moderate-fire-risk areas. But officials softened the language in the final version passed three years later, which remains the law of the land today: “Restrict development in areas that are constrained by the natural limitations of the land,” including fire risk. Officials could interpret just what that meant as they dealt with steady demand for more homes. Early plans for Fountaingrove noted the land’s history of wildfire but suggested a 30-foot perimeter around homes could mitigate the risk. On the steepest hillsides, plans called for building no more than one home per acre to limit the exposure to wildfire – a standard far exceeded by later development. About 50,000 people lived in Santa Rosa in the 1970s when HP moved in. Today, it’s home to more than 175,000. As the city grew, civic leaders remained committed to a small-town feel, which encouraged outward sprawl. Some hillside developments planted thick trees to maintain a wilderness facade, further increasing the fire risk. Where homes didn’t overtake the hills, the tree cover grew thicker. In 2001, a city fire inspector wrote a letter to The Press Democrat, hoping to start a conversation about the fire risk in these new neighborhoods. Pete Parkinson, who started with the Sonoma County planning department in 1996 and ran it from 2002 to 2013, said he couldn’t recall a time when county officials rejected a proposal on the basis of wildfire risk. Developers knew not to propose big apartment buildings where they didn’t belong, but much of the hillside real estate east of Santa Rosa long had been zoned residential. The county, he said, wouldn’t prevent someone from building there. “That’s the more difficult thing to address, in a planning sense,” he said. Rather than stop people from building, city and county officials added requirements such as fire-safe construction, a vegetation-free perimeter and multiple roads to escape a fire. In the mid-2000s, after Southern California wildfires devoured neighborhoods that had been cleared to the prevailing standard of 30 feet, residents in one Fountaingrove development cleared a 100-foot perimeter around their entire neighborhood. Another solution, of course, is not to smoke in bed. The first real test for all this planning blew in the night of Oct. 8, 2017, from a vineyard-lined road in Calistoga called Tubbs Lane. By a later count, the wine country was pummeled by 172 fires that night; the Tubbs Fire was by far the most devastating. Gusts reaching 70 mph propelled embers more than a mile ahead of the fire. Flames raced the distance of a football field each minute, climbing chutes to ridgetops and pouring down hillsides – a direction that wildfires aren’t supposed to run. “It was literally a torch and everywhere you looked was fire,” said Cal Fire Battalion Chief Jonathan Cox. Overnight, an area that almost exactly matched the boundary of the 1964 fire was returned to its previous condition: desolate and charred. For many living in the fire’s path, the smell of smoke was their first cue to run. But the Tandrups, in their new home built to the latest fireproofing standards, slept through the early hours while their neighbors escaped. Their double-pane windows dulled the sound of the rapidly advancing wall of flame. Their north-facing wall, lined with sound-absorbing, fire-resistant insulation, already was engulfed by 1:30 a.m., when they were awakened by a phone call from a concerned neighbor. With Lars Tandrup clutching their dog under one arm, the couple ran for their lives, stripping shoes and pajamas as they caught fire. The roar of the fire muffled their yells. Smoke limited their visibility to inches. Embers rained from the blazing trees above, and the hot pavement burned their feet. Behind them, the home where they’d lived for just a few months was consumed – fire-safe composite decking, thermoplastic heat-reflective roof and all. Crossing their driveway, the Tandrups saw their only route down the hillside was blocked by a wall of flame. With nowhere else to turn, they ran into it. The couple became separated. Lars doubled back to search for Ulla, but couldn’t find her. He struggled three-quarters of a mile down the road until a passing driver stopped and took him to an emergency room. As he was being carried in, he learned that Ulla, rescued by a Cal Fire team, already was there. The Tandrups, both in their late 40s, have since filed a lawsuit against Pacific Gas and Electric Co., one of dozens of suits claiming the power giant contributed to the fire by not maintaining its utility poles – another result, though avoidable, of building in the woods. Lars and Ulla Tandrup were treated for burns on their feet and legs, according to their attorney, Don Edgar; for months after the fire, Ulla remained hospitalized, fighting infections from her injuries. The Tandrups’ home was one of many fire-safe residences lost in the fire. According to a Cal Fire inspection of each damaged site, about 60 percent had double-pane windows and screens on their attic vents; half had fire-resistant siding. One thing the Tandrups had that many other homeowners didn’t was “defensible space” cleared around the home: Based on Cal Fire’s inspections, at least 3 of every 4 homes had vegetation within 30 feet. Local officials had encouraged homeowners to clear their properties, but the rules were lightly enforced. Sonoma County Supervisor David Rabbitt said the county’s program was “pretty voluntary.” Santa Rosa officials stopped conducting defensible-space inspections about a decade before the fire, due to budget cuts. As homes caught fire, they became more fuel for the blaze. Dave Sapsis, a Cal Fire scientist, said dense pockets of burning homes in the hills, such as those in Fountaingrove, played a significant role in the fire’s spread. Pete Parkinson, the former county official who spent his career planning communities to weather disaster, is retired now. But as president of the American Planning Association’s California chapter, he has a role in the ongoing conversation about fire-safe building. After what he’s endured, does he believe there are places that shouldn’t be developed because of the fire danger? 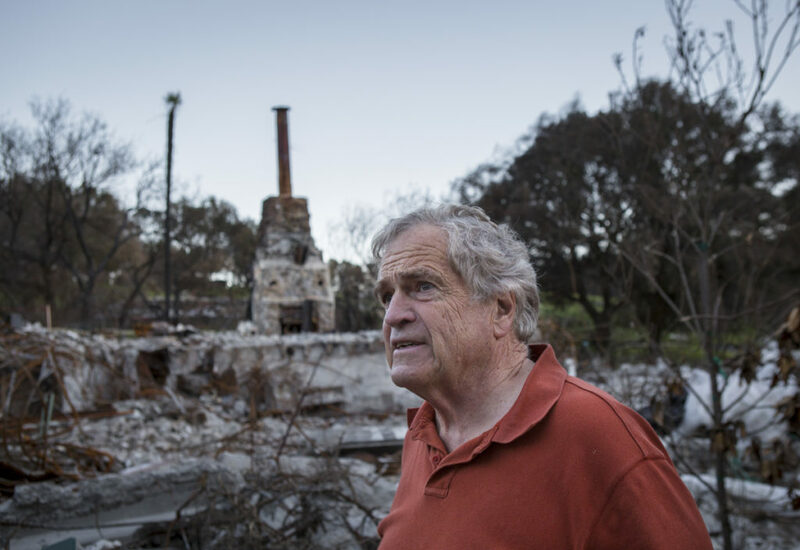 Parkinson lost his home in unincorporated Sonoma County to another fire, the Nuns, the same night as the Tubbs Fire. He’d fled with his family but was forced to leave before he could coax one of his dogs into the car. Returning to the scene after two months, Parkinson looked out at the empty space where his deck, built from hard, fire-resistant Brazilian wood, once stood; the heap of rusted appliances in what had been his kitchen; and the spot where his living room used to be. Somewhere in the wreckage, he was sure, were the remains of his dog, lost in the fire. Down the street, he pointed out a home where one of his neighbors didn’t make it out. Unlike the “miracle” fire of 1964, the October 2017 fires killed 44 people across Northern California. Still, he plans to build a new home right here, he said. He’s counting on the odds falling in his favor next time. Disaster recovery experts say the weeks immediately following a fire, flood or earthquake offer the best window for reform. While the images are fresh, people accept extreme changes to avoid repeating the tragedy. But those also are the weeks when people are most desperate to rebuild. The tension between these impulses was evident at the Santa Rosa City Council’s first meeting after the fire. In late October, the bowl-shaped council chambers filled with a mix of people anxious to rebuild their homes and others who couldn’t bear to return. “I do believe that there are places where people shouldn’t build houses, and arguably Rincon Ridge was one of those places,” Mayor Chris Coursey said, referring to the Fountaingrove hillside. But Coursey wasn’t willing to stop landowners from rebuilding a home they’d just lost. And the city could hardly afford to block development by buying burned properties. “That ship has sailed,” he said. The council soon faced a more difficult decision about new development in the fire footprint. This came with another kind of urgency: The city and county each stand to lose millions a year in property and other local taxes; both are desperate for new development. Hundreds of people who lost homes in the Tubbs Fire have put their land up for sale. 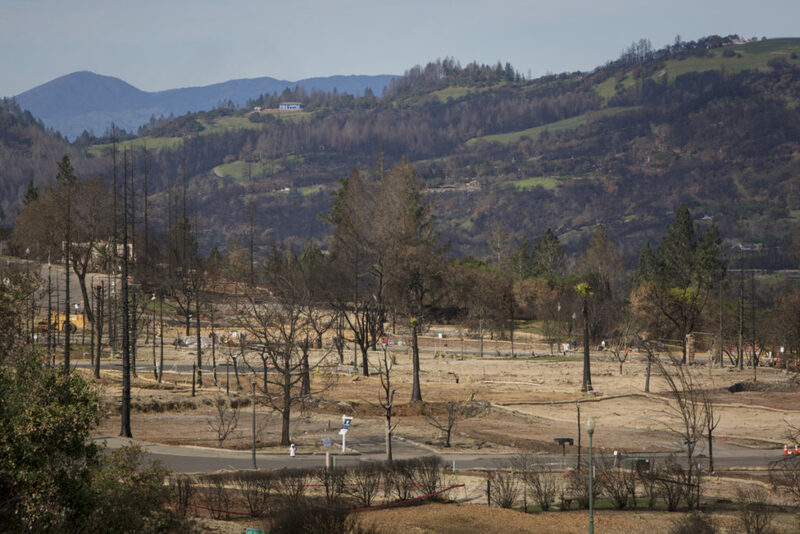 In December, the council took up a rezoning proposal to build hundreds of townhouses near Fountaingrove, on a field that burned in the Tubbs Fire. The project was called Round Barn Village, after an iconic red horse barn built by Thomas Lake Harris’ followers in 1899. It had been one of the last surviving relics of the commune until the Tubbs Fire consumed it. He and two other council members said it was too soon to approve new building in the fire area. With one member absent, the vote was a tie, and the council scheduled a revote two months later. Leading the opposition to the development was Council Member Julie Combs, who has a background in mechanical engineering and who spent the night of the fire dousing embers on her roof with a garden hose. Outside Sonoma County, other officials are beginning to agree. 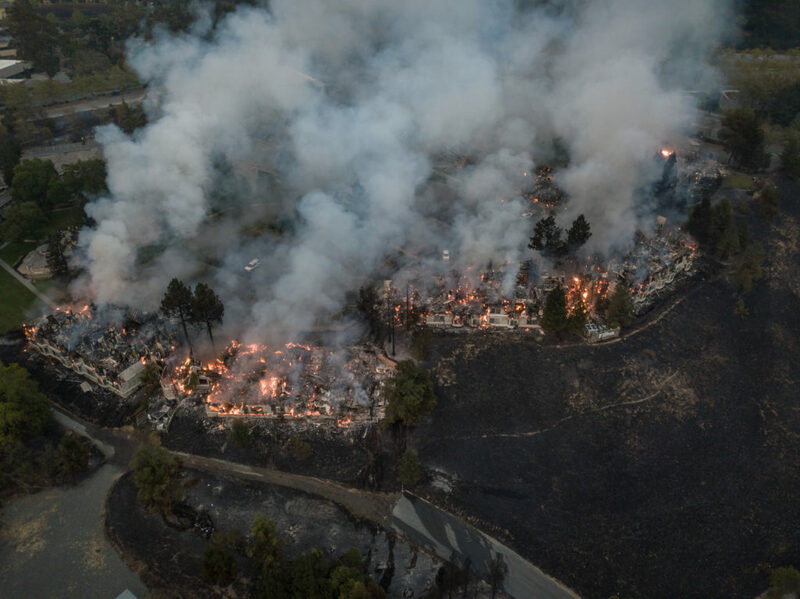 In March, a judge in Placer County halted a development that would have added 760 homes in an area with high fire risk, saying county officials didn’t conduct a thorough analysis of the land’s susceptibility to wildfire. PG&E, facing a legal onslaught from homeowners and cities in the fire’s path, defended itself in April by filing claims against Santa Rosa, Sonoma County and other local agencies, arguing that their poor urban planning decisions contributed to the fire. 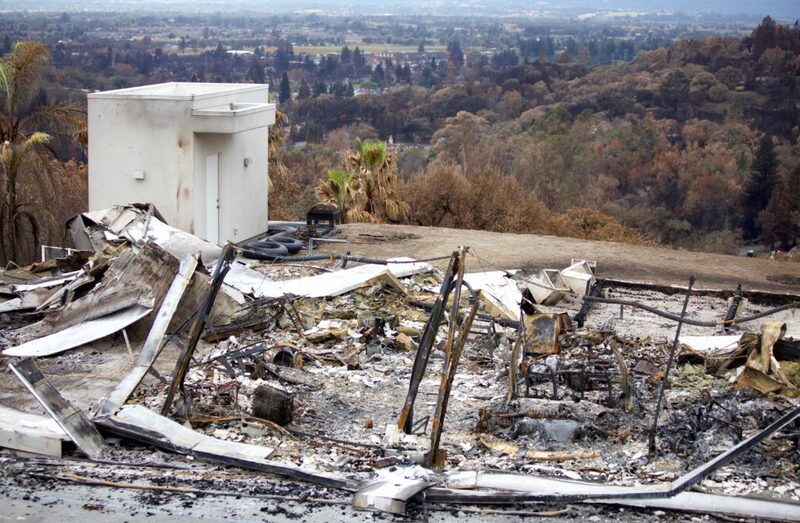 California Insurance Commissioner Dave Jones has said cities and counties must find ways to put fewer homes in places that are primed to burn. In a report released in January, his office noted that from 2010 to 2016, complaints more than tripled from people in high-wildfire-risk counties against insurance companies that raised their rates or refused to insure their homes. On the night in February that the Santa Rosa City Council convened for its final vote on Round Barn Village, the developer’s CEO, Phil Kerr, made his case. While he understood the fire risk, Kerr was confident the development would exceed the latest safe building standards. 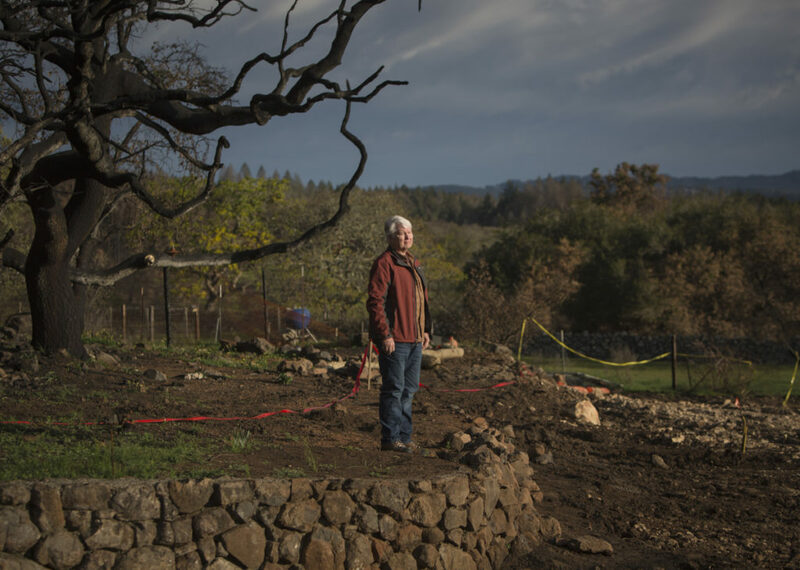 While building into the woods is a risky proposition, he said, this Fountaingrove site was hardly wild anymore ­– it was surrounded by 40 years of development. By the time Round Barn Village came up for debate, almost six hours after the council meeting began, the only public comments came from three local men who favored the project. One, building consultant Mike Cook, said he’d watched December’s meeting in horror, hearing the council’s reluctance to build new homes in a town that desperately needs them. Moon, the city fire marshal, presented his assessment that the latest fireproof building standards, from 2008, had been effective in the Tubbs Fire: Of the 1,458 homes in Santa Rosa’s wildland fire zone that burned last fall, city inspectors found that 22 were built in the last decade. Combs, the council member opposed to the development, pointed out that, looked at another way, just one of the 105 surviving homes in the fire footprint was built after 2008. The mayor acknowledged the statistics were a “mixed bag” but said he had come around since December. He wouldn’t stand in the developer’s way. The vote came in a quiet instant. With a click of the clerk’s switch, the council members’ votes appeared on a panel before their desks: six green lights and one red. The chamber emptied quickly. Combs was among the last to leave. Outside, the air was cool and still. How quickly memories can fade, she said. She saw the moment as a watershed, the beginning of the rush to build new housing in the fire’s wake. 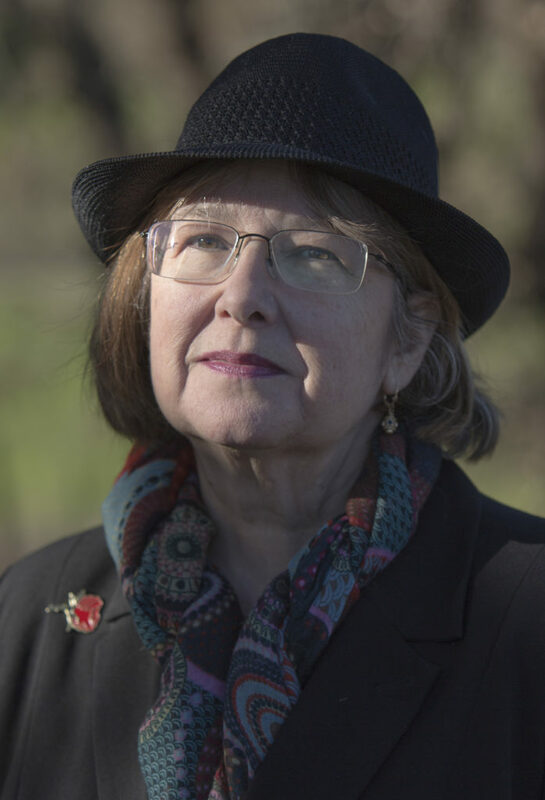 Maybe the people who approved Fountaingrove could be forgiven for not knowing the risk decades ago, she said. But that’s not the case anymore. This story was edited by Amy Pyle and copy edited by Nadia Wynter and Nikki Frick. Patrick Michels can be reached at pmichels@revealnews.org, and Eric Sagara can be reached at esagara@revealnews.org. Follow them on Twitter: @PatrickMichels and @esagara. Diane Seal walks where her home once stood in the Fountaingrove neighborhood of Santa Rosa, Calif. She’s lived in the area for nine years. Credit: CREDIT: Emily Harger for Reveal Lessons learned?